I live in the Midwest and my inspiration comes from my love of the Native American Indian and the American Cowboy. I love the colors that the Indians use in their clothing and headdresses. Everything about the southwest really inspires me. I use a lot of natural materials, natural stones, I love to work with turquoise and the different jaspers--the colors are beautiful, I also use sterling silver. The colors are the beautiful ocean and the blue sky in the pacific. I took a photo on vacation of the sea and beautiful sky--the color was breathtaking. 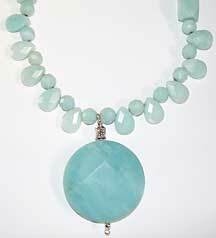 I saw this amazonite on Fire Mountain Gems' website and it all came together when I saw the stones. I began my first bead project about 6 years ago, when a friend took me to a bead store. It was like walking into a toy store for adults. I was hooked. We made a bracelet together. My best friend who had been beading for several years took me to a bead store. Yes. I majored in Art back in High School and I studied Art History in college. I have always loved creating with paints, working with different fabrics and colors, so designing jewelry seemed the natural thing to do. I was at a bead store and they sold BeadStyle magazine. I was looking through it and saw the ad for Fire Mountain Gems, so naturally I went to their website and I have been ordering from them ever since. I enjoy running; it helps me with my thought process. I have come up with beautiful ideas for jewelry while I run. 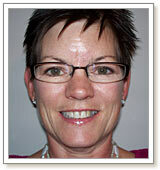 I am a member of the Grow Nebraska Association. It is a member only organization and anyone can become a member. They have three retail stores in Nebraska along with a website that the members can use to sell the items that they make. Making jewelry for me is very spiritual. I thank God everyday for the gift he has given me. There is not a minute in the day that I do not think about colors and shapes in designs of making a piece of jewelry. I love to see different stones and silver beads come together and make a piece of jewelry; it is very rewarding. Right now my jewelry-making is part-time, I hope someday it will be full-time. I sell my jewelry at all three Grow Nebraska retail stores and their website. I have not entered a beading contest, but maybe someday I will. A portion of my jewelry sales goes to help a Christian Radio Station stay on the air. I think it is very important that we keep Christ in our lives and the radio reaches a lot of people. It is important that you just do it. Any design idea is a good idea; if you do not try you will never know how it will look.